Location: Staff Room, Chrystal Macmillan Building (CMB), University of Edinburgh, 15a George Square, Edinburgh, EH8 9LD. Academics, activists, or the generally intrigued are welcome to join us for the first meeting of Edinburgh’s Mad Studies Reading Group. ‘Mad Studies’ aims to centre the experiences of people with lived experience of mental distress and to critique dominant theoretical models of mental health and distress in the psy-disciplines (psychiatry, psychology, and related professions). This first reading group meeting will be a chance to brainstorm ideas for a discussion group we would like to roll out in 2019. We’re hoping to create a safe(r) space to discuss theory, literature, culture, and share some of our experiences as researchers, students, and/or people with personal experience of mental distress. We hope for the group to bring in critical thinking of Madness and its intersections, including race, disability, class, sexuality, gender, and colonialism. This space is open to those with little to no knowledge of Mad Studies as well as those who are more familiar with it. The meeting will take place from 4-5pm on Tuesday 8th January 2019 in the Staff Room, Chrystal Macmillan Building (CMB), The University of Edinburgh, 15a George Square EH8 9LD. There is lift access to the room. There are gender neutral, wheelchair accessible toilets. There is free parking in George Square for Blue Badge holders. If you require any assistance with locating the venue or accessing the room, please let us know. If you’re interested in attending, we kindly ask that you please RSVP so we have a sense of numbers for catering purpose. There will be tea and coffee making facilities, snacks and soft drinks. You can register to attend via the Eventbrite page. If you’re not able to make the meeting but would like to stay in the loop, please send us an email and we will make a note of your email address and circulate any meeting notes and information regarding future discussion groups. Prior to meeting, we encourage you to have a closer look at Mad Studies as a discipline, to get us thinking about some of the themes we might like to incorporate in our discussion group. You can access a PDF of the first reading by clicking on the link: “Introducing Mad Studies”, from Mad Matters (2013) by Robert Menzie, Brenda A. LeFrancois, and Geoffrey Reaume. We will focus on pages 1-10. If you have any questions or suggestions, please contact Sarah at Sarah.Golightley@ed.ac.uk If there is anything we can do to make this or future meetings more accessible, please be in touch. We hope to hear from you and look forward to meeting with you in January. As genetic science develops at breakneck speed, cultural representations register in their form and content changing ideas about the self and personhood, consciousness, behaviour and motivation, heredity, and the boundaries of the human body. And yet, ‘western’ science is only one of a number of frameworks that provide explanations for these phenomena. Knowledge, assumptions and beliefs about what a gene is and what the human genome is, about inheritance, kinship, who owns the body, its parts and ‘data’, are not universal but are culturally produced, culturally interpreted, and culturally situated. For many indigenous communities, for instance, genes may be understood as ‘the ancestors within’ (Grace 1998), a perspective generating different philosophical questions from those raised by ‘western’ scientific frameworks about the make-up of the self and different ethical priorities regarding genetic research. In this symposium we seek to bring together two recent currents in contemporary biocultural scholarship: a) critical engagement with the representation of ideas from genetic science in media and cultural texts; and b) the development of postcolonial approaches to biomedicine and the life sciences, which interrogate the cultural biases and structural inequalities inherent in these fields. We shall explore the representation of genetic discourse in literature, film, news media, popular culture and philosophy across cultures, and will pay particular attention to representations from the global South. Confirmed speakers: Prof. Jay Clayton, Vanderbilt; Prof. Clare Hanson, Southampton; Dr Josie Gill, Bristol; Dr Shital Pravinchandra, QMUL; Dr Jerome De Groot, Manchester; Dr Jenny Bangham, Cambridge; Dr Lucy Burke, Manchester Met; Dr Lara Choksey, Exeter. The relationships between genre, form and genetic representations. We welcome perspectives from disciplines including literary studies, film studies, history, law, media and cultural studies, critical and cultural theory, philosophy, postcolonial studies, critical medical humanities, disability studies, and bioethics. We are also keen to include participation from creative practitioners (writers, filmmakers, visual artists, performance artists) whose work engages with genetic science, and welcome proposals for creative sessions (film screenings, readings, performances, art exhibits). Please submit 300-word proposals plus a short bio (100 words) to Clare Barker at c.f.barker@leeds.ac.uk. We also have a limited number of spaces for non-speaking participants; if you would like to attend please submit a short description (200 words max) of how the symposium relates to your field of research, creative or professional practice. The closing date for submissions is Friday 21 December 2018. This symposium is part of a University of Leeds research project on ‘Genetics and Biocolonialism in Contemporary Literature and Film’ and is funded by a Wellcome Trust Seed Award [grant number 106839/Z/15/Z]. Attendance is free and catering will be provided for all delegates. Accommodation and travel expenses will be covered for all invited speakers. Being HIV positive today is completely different from how it was thirty years ago. 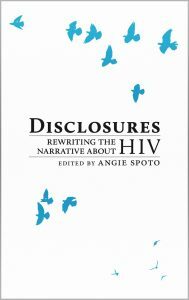 This anthology collects work from those affected by HIV so they can tell us what it really means to have HIV in Scotland today. Many of the stories, poems and artworks here emerged from the Positive Stories workshop series and artistic-mentorship scheme organised by HIV Scotland, empowering people to use their own voices to reshape the narrative around HIV and take part in creative activism. Available to buy from Stewed Rhubarb. Please note – preorders will be posted on Monday 26th November 2018. How to approach the experience of disability (sources, methodology)? Different categories of disability experience, or what counts as experience of disability? Stories about ageing, illness and care permeate ageing societies. Although illness and care are not an inevitable part of ageing, ageing, especially advanced ageing, is often associated with greater infirmity and increasing dependence on others. Common media representations evoke the apocalyptic effects of the burden of care as they pit a younger, able-bodied workforce against an ageing and frail population that threatens to bring financial disaster. And, yet, care is part of all of our lives: we live in a web of relations that support embodied life. As many in the field of feminist ethics of care have shown, serious illness and the care it necessitates focuses our attention on the very nature of selfhood and citizenship, as the prized neoliberal values of autonomy, independence and choice are undermined by intimate relationships between selves. Ageing, illness and care generate a complex nexus of affective, social and political relations and interactions that raise ethical questions about self and other. Literary and cultural narratives negotiate, and help us to explore, this web of interactions and the complex questions about subjectivity that they raise. Reading and writing about ageing, illness and care also encourages us to engage with the challenges that these may pose to individuals and to society. As we do so, we inevitably consider the representational limits and the possibilities of literary and cultural narratives. This conference welcomes papers that explore the intersections of ageing, illness and care in literary and cultural narratives in English and other languages; including prose fiction, poetry, life writing, comics, film and the media. Papers may engage with fields such as ageing studies, disability studies, queer studies, philosophy and creative writing, but are not limited to these areas of study. The language of the conference is English. 20-minute papers. Abstracts of approximately 300 words should be accompanied by a short biographical note. Workshops and panels. Panels should consist of three papers and the proposal should include abstracts for the panel and for each of the papers as well as the email address for correspondence. Workshop organisers should send an abstract outlining the scope and nature of the workshop along with details of all participants and the email for correspondence. notified of acceptance by 31 March.